On paper this one was always going to be a close one. The two teams had had very similar seasons up to this game where the last few weeks had put a bit of a dampener on what was so far a reasonable campaign yet play-offs or better were still on the cards. 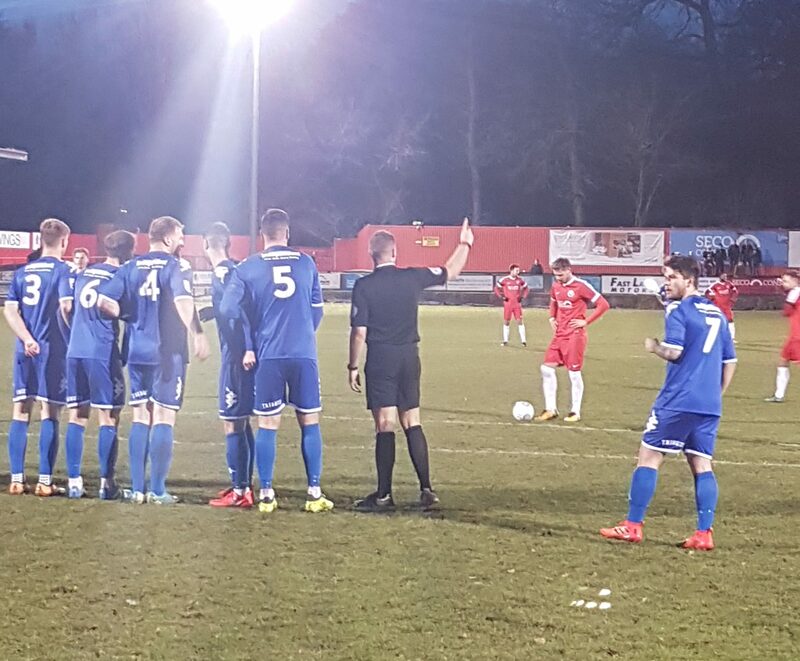 The Team news was always going to be interesting for Welling as Connor Dymond was out suspended and then on Thursday family tragedy ruled Olu Durojaiye out. These two would certainly be missed but it would give opportunity to others and as it turned out it gave Jamie Coyle the chance to experiment with a new formation, the ultra trendy 3-5-2. I am a fan of this formation, Tottenham use it well!, however it does put a lot of emphasis on the wing-backs and to win this one they would both have to perform well. I felt it also made sense as Truro play the same 3-5-2 way so it should mean Welling have players in the same areas of the pitch as them. I could not imagine Dymond playing as the right sided wing-back but his suspension meant I did not have to see that and anyway during the week Coyle had signed a man he knew well in Callum Driver to fit snugly into this space. Callum had been part of a Maidstone team that had got promoted through this league a couple of years ago and the opportunity to join up with Coyle again was clearly too tempting to resist, so a decent performance here could show him to be a very useful option to have in his time at Park View Road. Harry Phipps would play the holding midfield role giving Jack Jebb and Joe Healy some freedom in the middle of the park. Wide left was a strange one for me as I have thought for a while now that Archie Johnson was a left wing-back in waiting and that it was a shame for him that we never played this formation and now that we have, the more defensive minded Ben Jefford gets the call and Archie is on the bench. However, I do not see what goes on in training and Ben is still young so should have plenty of energy in those legs! The back three should have no problem as they are all experienced Centre-Backs and the ‘big man little man’ in attack has worked before and is no risk in my mind. The key men that would have to take a seat on the bench due to this formation change were the wingers Monakana and Nanetti but we know what these guys could bring and they could be key figures later in the game should it start going wrong. So those were my thoughts as I took my place ready for kick off. 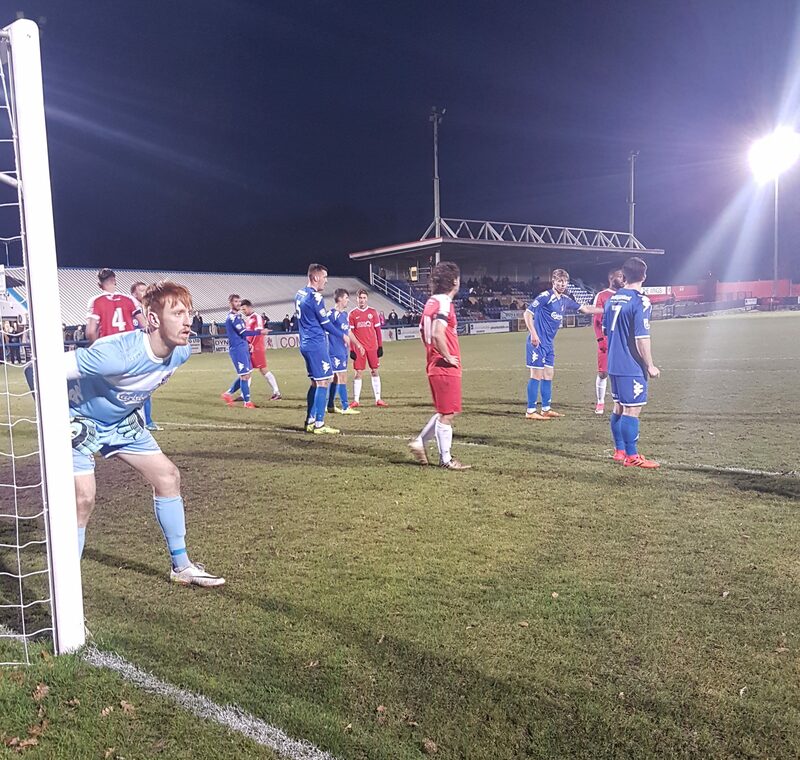 Last week Welling started awfully and Sandford had to make several saves to keep the score down early in that one. This start was much better and although our keeper did have to show good handling it was the home team that had the clearer chances. An early Jebb corner was just missed by Coyle but Jack Parkinson got on the end of it and slid in to put it just wide. Bradley Goldberg created a few chances for himself but could not get it past Tom Mchale, or the ‘Sherminator’ as he got called by the fans behind the goal. Unfortunately the lead did not last long. Cody Cooke turned and shot from just inside the area and the accuracy was too much for Sandford. 1-1. It was fairly even then for the rest of the half with no clear chances for either team. Callum Driver was impressing on debut and got plenty of ball. Bradbrook battled up top against their two centre halves, continually looking to flick on the long ball that Parkinson, Coyle or the keeper would lump up the pitch. The ref has seen enough for a First Half that Welling shaded but it’s all even. An interesting note was how early The Wings returned from the break. Craig Lewis had the lads warming back up a good few minutes before the opposition entered the pitch. It was a plan that may well have worked because a few minutes in to the second half a Ben Jefford cross was headed home by Bradley Goldberg, he celebrated, I celebrated, the linesman raised his flag. Not too sure about that one Lino! It was definitely close but it certainly wasn’t given as a goal so it was still 1-1. 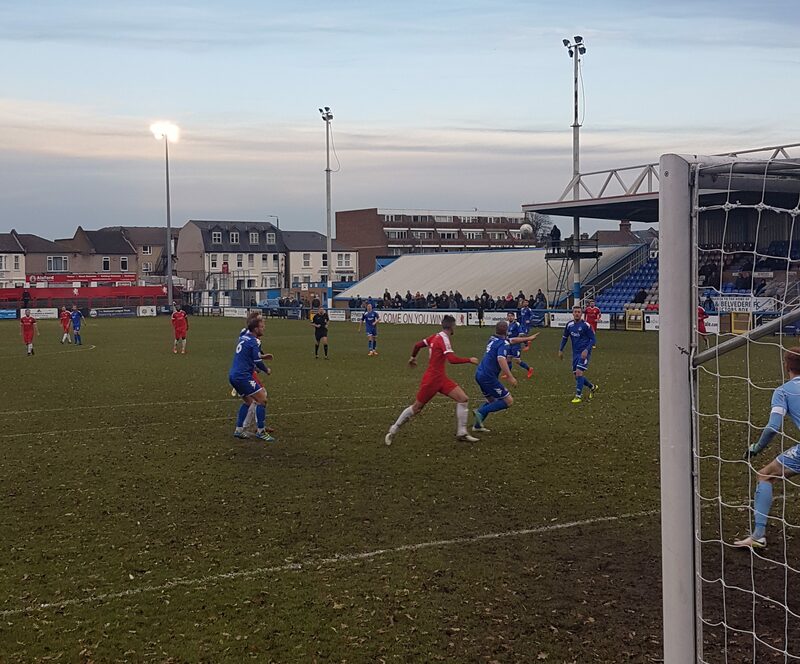 Just to make it worse, a few minutes later Connor Riley-Lowe played the ball to Tyler Harvey over on the left and he hit a low effort from an acute angle past Sandford which found the corner of the net. 1-2. Harsh on the lads as we were the better side here. It was time to look to our big game players to get us back into it, however we had bad news. Firstly our captain for the day, Joe Healy went down with a leg injury. It looked a bad one and he could be out for a few weeks. Christian Nanetti came on for him. Then Tom Bradbrook felt his hamstring was too tight, so Eli Phipps replaced him. Eli was now playing his last game for Welling before returning to Colchester. He has impressed me a lot during his stay here and is someone I really hope can make it in the game. But for now I just wanted him to score an equaliser here. 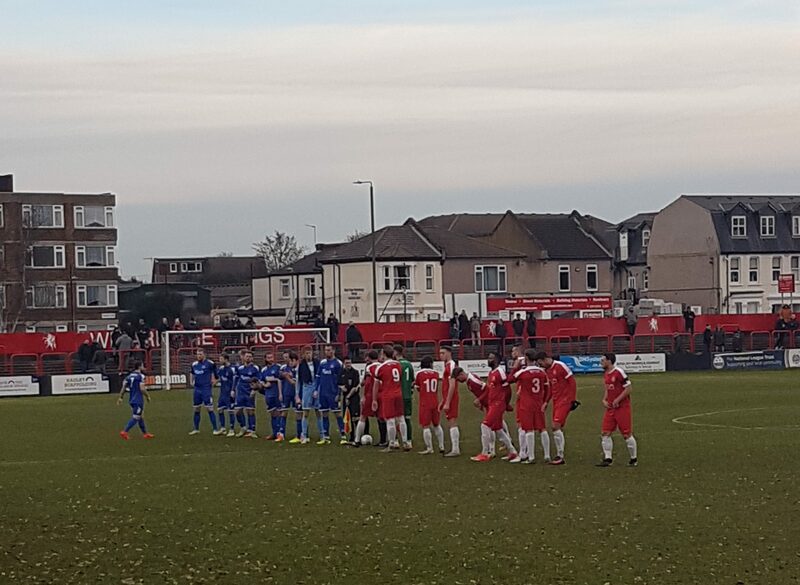 Welling were pretty dominant for a spell and had gained a Free-Kick not too far outside the area. Jack Jebb stepped up. So far he was having a mixed game, his delivery can be excellent but too many times in this one he was not beating the first man from corners. I felt he also gave the ball away on too many occassions. However I am a Jebb fan, I feel he would be more suited to life further up the footballing ladder as he is gifted and good on the ball. I am sure football gets tougher and uglier the further down you go and he is at the level now where sometimes he does not get to show how good he is because he sees things differently to his colleagues. One thing he can do is put a free kick into the top corner, we had seen him do it before and here, when we needed it, he done it again. The Sherminator was rooted to the spot. 2-2. Game On. From now on in both teams had chances. 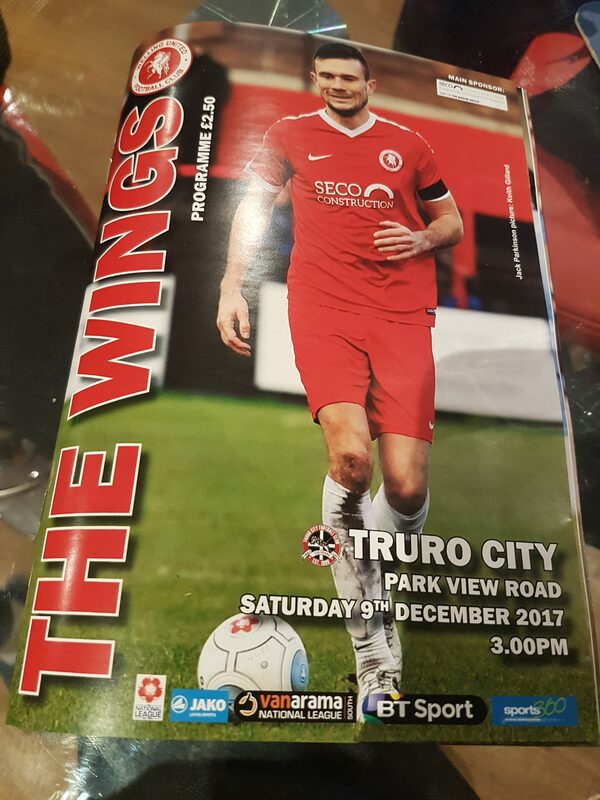 Cooke kept Sandford busy and Lamont hit the bar for Truro whilst Goldberg was a constant pest around the box and Callum Driver shot just over. Late in the game Jefford left the pitch injured to be replaced by Archie Johnson but he did not have long enough to make much of an impact as it was soon over and both teams had got a point. Overall it was probably a fair result although I couldn’t help but be a bit frustrated that the Goldberg Offside goal did not count. We had certainly played much better than the two defeats I had seen here recently though. I actually quite enjoyed the game! The change of formation had worked and is certainly an option that we could use again. Harry Phipps won the Sponsors M.O.M award, strange in my opinion as I thought he done a decent but fairly quiet job in the middle, where my choice would have been Callum Driver who I thought had been excellent on his debut. He needs to play next match so good luck to the boss for trying to fit Connor Dymond back in! Ryan Sandford had again been excellent and Goldberg seemed back to his useful self. If there was a downside it would be from the the three centre-backs. Ian Gayle had a bad day, hopefully it was a one off. The other two are great defenders but a bit old school and love to hoof it up to Bradbrooks’ head. I understand the need for that at this level but I would prefer one of the more skilled midfielders to make themselves available and build it up from the back. We have boys who can play with the ball and I would like to see more of the ball staying on the floor. I saw Weston do it here last month so it can be done it just takes a lot of work on the training pitch and that is time that Welling now have. Poor Cup performances mean a weekend off so thats 14 days before the next game, away at Chelmsford. They may well sneak a friendly in and that could be good to work on shape but also it gives time to rest those that went off injured today. 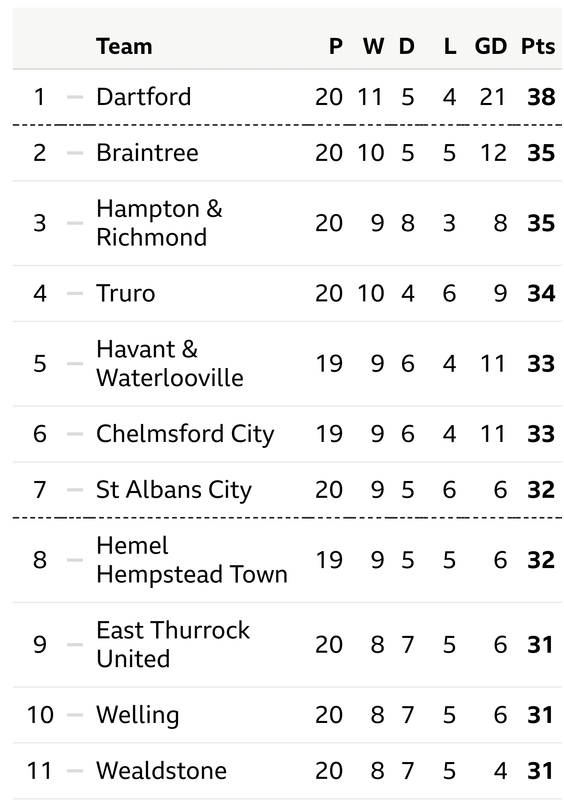 Welling move up a place into 9th but its tight up there. 8 points separate the top 12 teams and although we have not gained a victory for over a month there is still plenty to play for. The fixtures over Christmas are against teams in and around us and any points gained in those are going to be well earned and vital. To some of the regulars frustration has risen during this recent run but these people need to realise that Welling are no longer handed that National League place on a plate. Money talks in this Non League now and our playing budget and attendance figures suggest we should be a mid-table team so to out-perform that at this stage should be seen as a small success and there really is no need to get on the players backs every time a ball is misplaced however frustrating it can be. The table does not lie and it does not give a toss about history and sentiment so we should forget where we have been and realise where we are and work together, the team and supporters, to try and push the club in the right direction as one. Away games are more fruitful and maybe a reason for that is the lack of negativity from the stands, and seats, so if you are one of those that is constantly barracking our players or our Management team then I ask you to think about how is that going to help the cause? Opinions are great, encouragement is better. There seems to be a lot of positives coming from developments in the Youth set-up and what is going on with the Academy and Rondos and the recent cup run that Tristan and the lads went on was both enjoyable to watch and beneficial for those involved. The future looks bright and if we all pull together so can the present.